You can create "Projects" in GoAnywhere MFT to define the file transfers and business processes to perform. A Project can contain multiple steps (called tasks) to execute as a seamless end-to-end workflow. For instance, a Project may include a task to retrieve data from a database server, a second task to convert the data into an Excel document, a third task to encrypt the document, and finally a task to distribute the encrypted document to an SFTP server. There are no limits to the number of tasks that can be performed within a single Project. Projects are designed using intuitive wizards and templates with the GoAnywhere MFT browser-based interface. No programming or special technical skills are needed. The Project definitions are stored in a central database, which can be scheduled and executed by authorized users and applications. The module that handles Workflows is called Advanced Workflows. Watch our on-demand webinar on 10 Ways to Improve Your Processes with Advanced Workflows. How are GoAnywhere modules licensed? Visit our Licensed Modules page for details. Projects are organized within user-defined folders. Each folder can have granular permissions to control which users can view and/or execute the Projects within that folder. For instance, users within the HR department may only be authorized to run Projects within the HR folder. Projects can be run in Debug mode, which allows users to interactively execute tasks one step at a time. 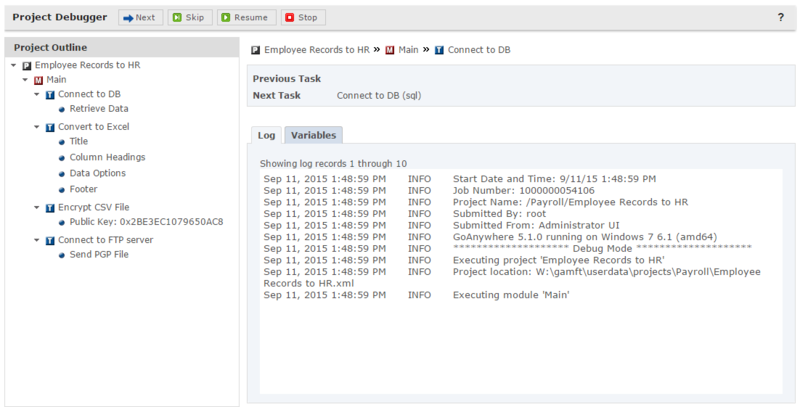 The job log and variable values can be monitored during each step while debugging. At each stopping point, the values for the variables can be changed before the next task is executed.